Reinforcing bar (rebar) comes in lengths of up to 60 feet. In theory, this would seem to obviate the need for splicing the material for all but the largest commercial projects. In practice, however, most building projects involve extensive rebar splicing. This may be due to any number of reasons, such as shipping constraints on length and efficient use of materials. A lap splice is the most common method of creating a single structural entity from two rebar segments. The lap splice, as the name suggests, is created by overlapping two lengths of rebar, then wiring them together. From a structural point of view, the most critical aspect of a lap splice is the overlap length. 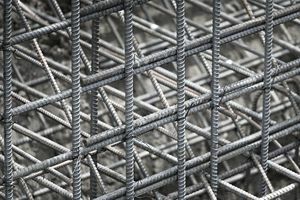 Note, however, that overlap requirements vary with both rebar size and the specific structural application. In almost every construction situation, overlap lengths are subject to local building codes. Although it's imperative to check your local code for detailed compliance requirements, most codes are based on the IBC (International Building Code). IBC code requirements are almost identical to the American Concrete Institute (ACI) codes. ACI code section 318-14, which governs rebar splicing, has been incorporated without meaningful modification into the corresponding concrete section of the 2015 and 2018 IBC. Therefore, either the IBC code sections governing concrete or ACI 318-14, current as of 2016, provide reliable information about lap splice code requirements. Keep in mind that the governing code for your project is the local building code. Inspectors will not pass a project that is IBC code-compliant if it conflicts with the local version of the code. Furthermore, almost all U.S. jurisdictions now require a structural engineer's approval stamp on any structural aspect of the building plan. A structural engineer will take into account the standard requirements as well as exceptions for critical stress points, different splice length requirements when connecting rebar of different diameters, and requirements for staggering splices to prevent congestion at overlap points, which can result in inadequate concrete flow into the splice area. All splice locations must be specified in the structural plans before approval. The following are the IBC/ACI splice length requirements for the most common type of lap splice, the contact splice. Other types of splices that are code-compliant include mechanical splices and welded splices. The code requirements for the wiring material and fastening method are brief and note only that the wiring method employed should "secure" the rebar in place. The lack of specific requirements for the wiring material or specification of the wire wrapping method may seem surprising at first, but the wire's sole purpose is to hold the rebar temporarily in place. Once the pour is completed and the concrete has begun to harden (within a few hours of the pour), the wiring material has no further purpose. Standard splice lengths do not apply when the rebar needs to be drilled into the concrete. In this case, the structural engineer must determine the embedded depth of the rebar and the appropriate product to anchor the rebar to the existing concrete.